You can’t go wrong with a good electric meat grinder. They come in different shapes and sizes, but they all offer one thing. Electric meat grinders offer a faster and safer alternative to cutting meat than traditional methods. You’ll save a lot of time and money when investing in an electric grinder. We created this guide for the first time shopper that’s still skeptical about their first grinder. Here, you’ll see every mechanic, spec, and feature that most popular products tend to have. Keep reading this guide so you’ll have an increased knowledge and extra insight when shopping. As its name suggests, electric meat grinders uses motor powered engines in order to grind up the meat. This makes them faster than traditional methods as it requires less user effort in order to reach the same result. While you can opt for a manual grinder, the economical choice isn’t always the best option. 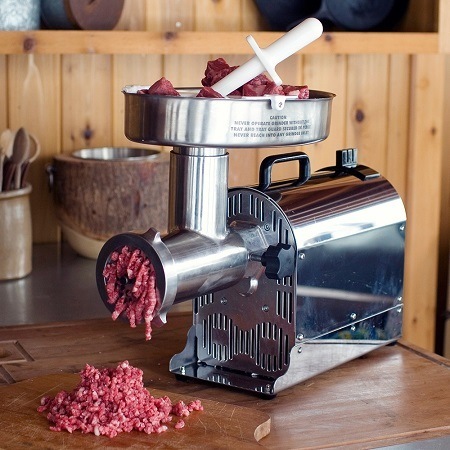 For example, a manual grinder will take a lot longer to cut through a large volume of meat instead of an electric one. Thus, you should consider getting an electric meat grinder due to their enhanced performance and ability to quickly cut through most kitchen meats. Look into an electric meat grinder if you are planning on grinding a large quantity of meat on the go. The power that comes out of the electric grinder’s motor cuts through the meat faster than in comparison to manual methods. If your kitchen meat has small bones hiding behind the meat, the electric meat grinder can still cut through it. However, much effort would be required in order to cut through the bone efiicently. Every electric meat grinder has a gear system attached to it. On some occasions, the gear system can fail temporarily. If this happens, follow the manufacturer’s recomenndations. It will start to run smoothly as normal. Make sure not to go over your electric meat grinder’s capacity. Doing this causes you to severely damage the meat grinder and make it impossible to repair. Electric meat grinders are harder to repair than manual grinders so make sure that you take good care of your first grinder. Motors - Every electric meat grinder generates their power from motors. The more horsepower, the faster and more effectively the grinder can operate. Some brands allow a motor warranty, where the user is protected if the motor wears out early. Feeding Tube: The feeding tube is where the food goes to the ground. The size of the grinder is directly correlated to the diameter of the feeding tube. Cutting Blade: The cutting blade is a star shaped metal blade that cuts up the meat. Practice safe caution when using the cutting blade. Auger: It’s also known as the worm or the screw. The auger grabs the meat and places it towards the grinding plates and the cutting blade. Meat Tray: This is where you hold the strips or cubes of meat before placing it in the feeding tube and through the cutting machine. Plunger or Metal Pusher: It’s used to push the meat through the meat through the feeding tube so it’s auger can get it ready to be cut by the blade. There are three different meat grinder types and all of them have their advantages and disadvantages. You should only use a manual grinder if you plan on grinding your meat occasionally. But if you do buy one, you’re going to have to use some elbow strength in order for it to work. Manual grinders require human labor and effort to. the meat and can be a challenge for beginners. They aren't recommended for chefs and people who can’t physically push through the grinder. Manual grinders require practice, strength, and effort in order to work. Manual grinders are great for places that don’t have an ample amount of electricity. Most people tend to use manual grinders in secluded remote areas such as cabins where a good source of electricity isn’t always there. Plus, they are sturdy making them virtually unable to break. Many shoppers choose them due to their dependability and durability.If you are someone that has patience and the ability to grind up the meat with your muscles, a manual grinder is a perfect option for you. Electric meat grinders have one main purpose to fulfill. They are made to grind multiple pounds of meat without causing the user to strain themselves as they would using a manual grinder. Electric grinders will cost more money than average than manual grinders, but their strong engines help grind through the meat effortlessly. In addition, electric grinders have inter changeable grinder plates. This helps users replace different textures using only one grinder. Also, this gives users multiple grinding styles for users to change and experiment with. Look into an electric grinder if you’re planning on cutting more than the average type of meat. 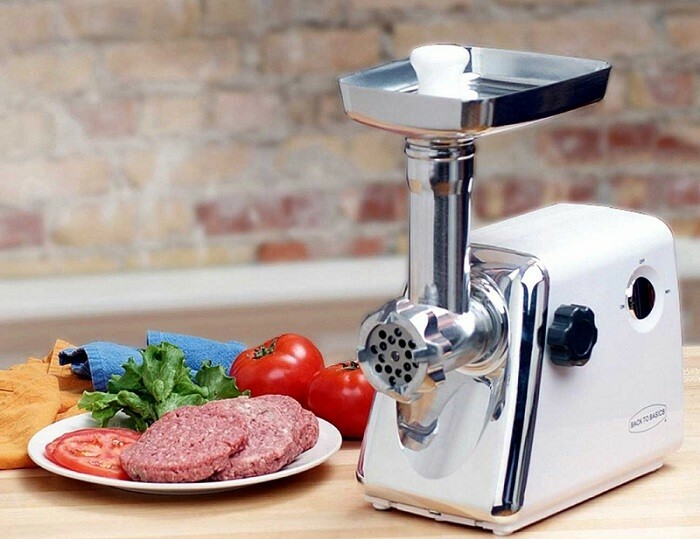 These grinders are made for users who want to sell any type of meat. Commercial meat grinders are not recommended for domestic usage. 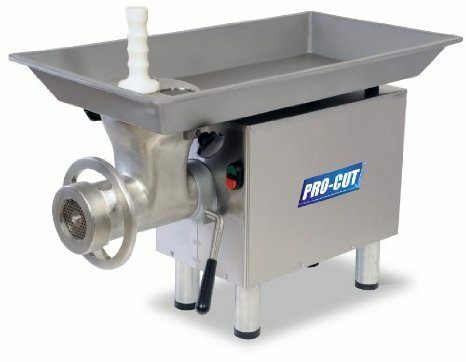 Chefs, butchers, and people in related industries tend to use commercial grinders. While commercial grinders are a huge investment, they have a huge pay off and reward as well. For professionals, accuracy and speed are important factors that come into play when getting a meat grinder. Commercial grinders are perfect because they come into play in this situation. Another advantage is that commercial grinders are large in size, can cut through large quantities of food and meat in one movement, and has a myriad of settings. Commercial grinders are expensive, but they have a great return on investment. For chefs trying to run a successful businesses commercial grinders are the standard and most recommended option. Portability: Manual grinders work even when there’s no electrical source nearby. You aren’t tied down to the need to plug in the device for it to work properly. Basically, you can use your manual meat grinder in virtually any situation. No Extra Electrical Cost: Since manual grinders don’t use electricity, you’ll save a lot of money using them. If you grind your food daily, you don’t have to worry about paying extra on your electric bill. Affordable: Manual meat grinders cost less than electric ones. For novices and users on a tight budget, manual grinders offer a lot of utility. Health Issues: You should be very careful when cutting raw meat. You should not have raw meat sitting in warm temperatures for a long time. Since you’ll take longer cutting through food using a manual grinder, you’ll have to freeze up larger batches of meat and use them once at a time. Too Much Physical Effort: Some consumers find manual grinders strenuous to use. Grinding meat can take a long time, especially if you have to cut through larger batch. No Electrical Motor: With manual meat grinders, you’ll limited by the power of your arms. You’ll never be able to cut up meat with the same level of accuracy and efficiency as an electric meat grinder. Cleaner and Safer: Electric meat grinders don’t require users to use both hands. You’re less likely to run into the risk of contamination because you’ll rarely come in contact with the meat. Since they are faster, the meat won’t be exposed to warm temperatures for too long. Easy to Use: All you have to do is assemble your grinder. Then you have to plug in the grinder and switch it on. This plug and play feature is better than manual grinders where you’ll have to bolt it to a surface. And, electric grinders are easier to eat through the meat tray. Electric grinders consist of a food pusher which makes it easier to pass the meat through the machine. 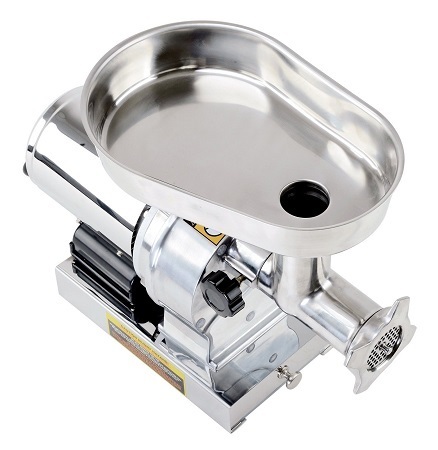 Extra Power: You’ll have the motor power on your side when using an electric meat grinder. Depending on the wattage, horsepower, and other parts of the grinder, you’ll have to grind out more pounds per minute than a manual grinder. You’ll be able to grind out hundreds of pounds in one hour using an electric meat grinder. Expensive: Electric grinders cost more money and are more expensive than manual meat grinders. There are some cheaper models, but the better quality grinders come with a large price tag. Portability: Every electric grinder model needs a power source to operate. Electric grinders are also harder to lift which makes them more tedious to carry. Getting the best grinder is dependent on your personal preferences and how much you plan on spending for it. If you only have to grind a few pounds of meat and on a few occassions, then get a manual meat grinder. If you are grinding large volumes of meat and need something to work at a fast frequency, the electric grinder is the more rational choice. 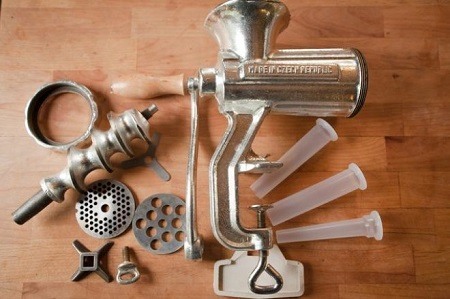 You have to understand the specs of your meat grinder before buying it. This ensures that you’ll have a meat grinder that will last long and work to your expectations. Here are a few specs that you should keep in mind. Finding the size of your grinder is very important. There are a lot of sizes available that’s sold in the market but you need to determine the purpose of your grinder as well. For example, you want to grind up a large batch of meat quickly for gatherings, pets, and events. Then you need to go for a more powerful and stable electric meat grinder. But, you might just cut meat occasionally. 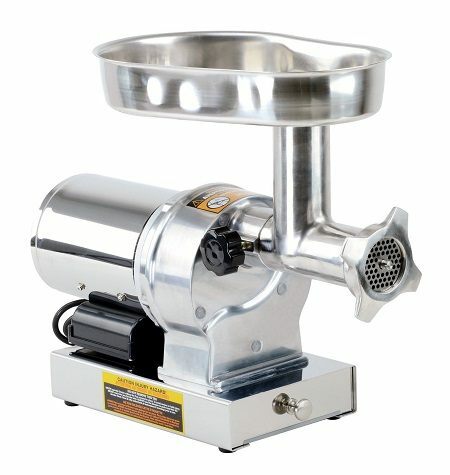 Get a smaller meat grinder if you’re cutting meat of small sizes for meals such as meatballs and burgers for you and a guest. And smaller meat grinders have more portability, so you should buy a small grinder if you travel frequently. 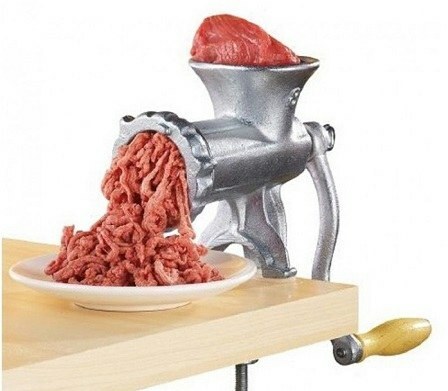 Here is a table that lists the most common meat grinder sizes that you’ll find in a home. For simple meat cutting, a 5” sized grinder will do the job. But if you’re cooking for a large family, a grinder that’s a range from 12 - 32” will suffice. Your meat grinder’s power comes from watts. Meat grinders that are around 300-500W are priced about $100. For the stronger 800W motors, they are charged around $200. Motors that are 800W are usually needed for commercial purposes. 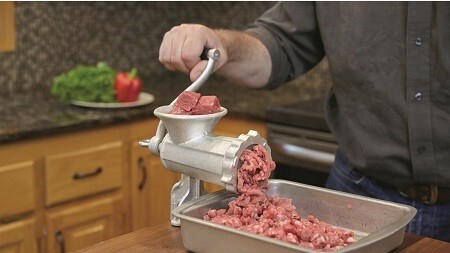 The stronger the meat grinder machine the more efficient it is at cutting large volumes of food, chicken, and meat. You’ll also become less frustrated and can cut larger batches of meat faster than by hand and slower machines. If you want a stainless steel electric meat grinder, you’re going to pay a lot more than other models made of steel or aluminum. For users who grind a lot of meat daily, a stainless steel grinder is your best bet. They are more sturdy and heavy duty because their internal gears consist of metal and not plastic. 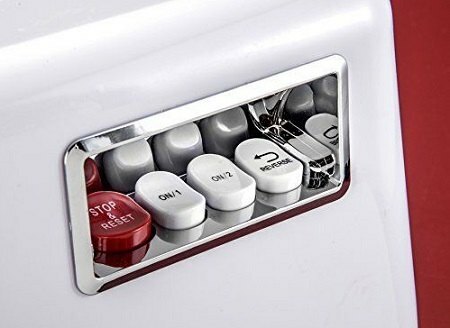 In addition, stainless steel grinders come with additional stainless steel accessories; you can place them in the dishwasher so you can clean them up afterwards. Remember, stainless steel grinders weigh a lot more than their non-stainless steel counterparts. So if you have to move the grinder around, it will be difficult. For example a non stainless steel #12 grinder weighs 15 pounds. A stainless steel grinder weighs 40 pounds. That’s almost a 3x difference! We recommend that you use your stainless steel grinder in a stationary position and correctly handle heavy duty cuts. If you plan on grinding meat occasionally, aluminum is the way to go. It’s lightweight and compact, which helps users who work in busy kitchens. But, you won’t like aluminum due to its low durability. Consumers report that aluminum meat grinders are more likely to be exposed to rust and is easier to damage. Because of this, it should only be used for quick and short cutting batches. We recommend that you buy a stainless steel type of grinder to receive the best results. The meat pan capacity refers to how much meat can be pushed through the machine at once. For basic grinders, they’ll have a meat pan capaicty of over 2-4”. But if you’re looking for a grinder for large projects and family meals, a capacity of 14” and above will do you just fine. Don’t think that you’re done with the meat grinder after you’ve bought it. You still have to keep it properly mained by lubricating it. It’s suggested that you use lubricating oil on your meat grinders to prevent its wheels from attracting rust. Cuisinart is an American company that’s ran by the Conair Corporation. Their products are of high quality and they gained their reputation for creating the first electric food processor. We suggest that you buy from this manufacturer if you want an electric meat grinder that’s long lasting and is guaranteed to get the job done. LEM is an online and mail order business located in West Chester Ohio. They deliver jerky making and meat processing equipment. LEM’s wide variety of products are great for making jerky, sausage, and other forms of meat products, all while having control and creating healthy content of food that they give to their friends and family. STX specializes in making stainless steel meat grinders. Each of their meat grinders are resistant to rust and are can be used in high temperatures as well. The manufacturer’s best rated products are: meat grinders, food marinators, food dehydrators, etc. George Weston Limited also referred to as Weston is a Canadian food distribution and processing company. What makes them stand out from the competition is their automatic meat grinders. Simply place the meat on top of the feeding tube and watch it grind the meat within 30 seconds. You’ll like Weston’s products if you want something that can cut through a large volume of meat. Their automatic grinders run on an average of 2 HP motor speed, giving you enough motor speed to cut through all of your foods with ease. Weston is a great manufacturer for beginner and professional chefs alive. The Kitchener is a manufacturer that helps users find ease when cutting through meat. 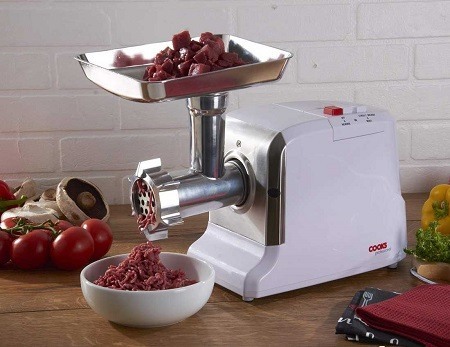 On average, each of their electric meat grinders allow you to cut up 176 lbs of meat in one hour. You should buy from this company if you’re serious about getting meats cut at a premium level. At some point, your meat grinder will become jammed either voluntarilty or involuntarily. That’s why some meat grinders provide a Reverse Function. This safety feature works by reversing the motor to help you remove the jam and continue cutting meat correctly. 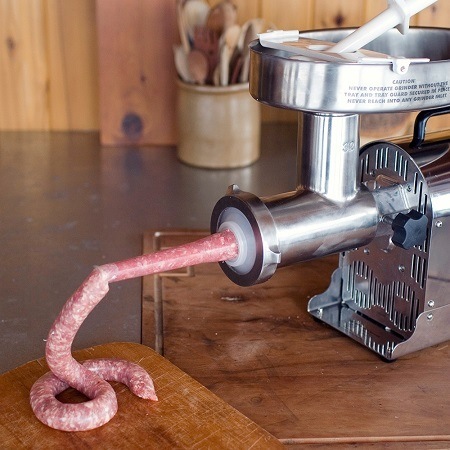 Most users tend to use meat grinders to create sausage. That’s why a lot of electric meat grinders come with a Sausage Stuffer, or a sausage attachment. 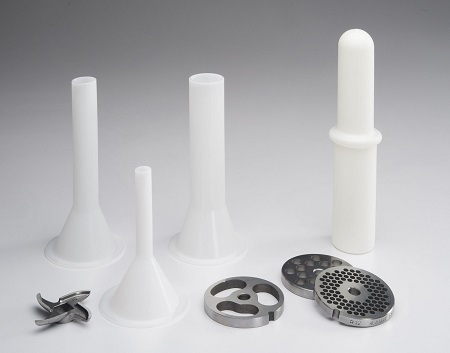 Sausage attachments are one sized funnels that can guide the meat into a multitude of casing types. The plates of your meat grinder will determine how coarse the meat is after its been processed. The more plates your grinder has, the more cutting options that are available. Check for models that have a stainless steel plate. Your electric grinder should have a ½ inch, ¼ inch, and a ¾th inch plate. Adding your meat grinder into a home appliance collection is the best and easiest way for your family to know what they are eating. You’ll avoid bacteria, chemicals, and additives that’s usually seen in store-bought meats. Then, it only takes a few minutes for the meat to be grounded up. Maintenance is an important part of your grinder but luckily it doesn’t require that much effort to do it. You should only take a few minutes to clean and maintain your grinder. We feel that those minutes spent cleaning your grinder will be well rewarded once you and your family start eating. You don’t have sharpen your blades every time you’re finished using it. The act of rubbing the meat and grinding against it automatically sharpens the blade. But, if you use an electric meat grinding unit enough, you will have to sharpen the blade at some point. Once your blade becomes dull, you should get it professionally sharpened. Wrap your blades around in cloth in order to preserve and maintain its lifespan when it’s not in use. This prevents the blade from getting nicked or dulled when its in storage. Oil prevents oxidation and rust. That’s why it’s important to coat your meat grinder part with a small layer of oil. Most chefs tend to use food-grade mineral oil for this, but you can use any form of oil if you’re in a pinch. You should use a spray bottle that has mineral oil. The mineral oil coats through all of your parts, and takes only a few minutes to use properly. After that, you’ll want to wipe or spray the metal parts including the screw and the pusher of the grinder. Once completed, store the pieces inside a plastic bag. Additionally, you can throw rice inside of the plastic bag. The rice prevents rusting by absorbing the moisture. You can use beach as a disinfectant, but make sure that you wash off the bleach before adding food inside the unit. While we have taught you everything you need to know about electric meat grinders, there’s still a few things we have to explain. We want you to look at our buying guide so that you find the best electric meat grinder for your personal needs. You already have the knowledge, now it’s time to buy a grinder that’s worth your time and investment.